Any idea what this Gun is ? MOSCOW, July 15 - RIA Novosti. 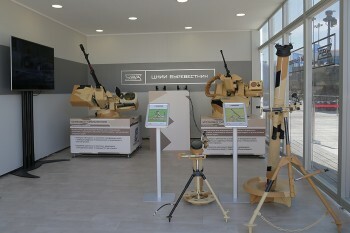 CRI "Petrel" develops in the interest of the military defense self-propelled anti-aircraft artillery system caliber 57 millimeters, surpassing the leading foreign counterparts, he said in an interview with RIA Novosti CEO of the company Georgy Zakamenny. "We are creating a 57-mm rapid-propelled anti-aircraft artillery system for military defense. Without revealing details, I can say that the level of tactical and technical characteristics of the created military equipment surpasses the best foreign counterparts," - he said. According Zakamenny, "Petrel" also suggested Navy quick-automatic gun mount similar caliber - now solved the question of acceptance into service. "Sailors, we also offered a light 57-mm quick-automatic gun mount, remote-controlled machine-gun units of various caliber. These weapons can effectively solve a very wide range of tasks. The choice - the command of the Navy," - a spokesman said. At first I thought it was related to the A-220 turret 57mm gun upgrade for the PT-76, but the article mentions it is for air defence units... I doubt they will reintroduce the S-60... I rather suspect they have probably developed an anti aircraft gun version to their new anti armour gun for IFVs... as was shown during WWII the high velocity of anti aircraft guns generally made them effective in the anti armour role so they might just be the same gun. Even without guided shells this will be a very powerful weapon, but with guided shells the high rate of fire requirement for engaging manouvering fast targets becomes redundant... This means more efficient use of ammo, and much higher kill rate... especially against low cost targets. The long-forgotten 57 mm caliber guns are being given a new lease on life in the Russian armed forces with a new such cannon raising admiring eyebrows everywhere. Originally designed for use on small ships, the AU-220M 57 mm automatic gun was later adapted for land use. The result – a truly magic gun, which is bound to be the biggest attraction grabber at this year’s Russian Arms Expo in Nizhny Tagil. With a rate of fire of 300 rounds per minute and a horizontal range of 16 kilometers this gun is an ideal weapon against all types of aircraft and armored vehicles, including tanks. Well, a 57 mm projectile will hardly cut through the 1 meter-thick front armor of an Abrams or Leopard tank, but a hail of high-explosive projectiles will surely wipe out optics, aerials, smash caterpillar tracks and jam the turret. In addition to its high rate of fire, the heavy 57 mm gun module which boats an uninhabited turret, active protection and an excellent Russian-designed fire control system, performs easy 180 degree turns while ensuring highly accurate fire. Also featured at the Nizhny Tagil expo will be a new version of the BMP-3 armored vehicle sporting a 57 mm gun combat module. Originally designed for use on small ships, the AU-220M 57 mm automatic gun was later adapted for land use. The result – a truly magic gun, which is bound to be the biggest attraction grabber at this year’s Russian Arms Expo in Nizhny Tagil. With a rate of fire of 300 rounds per minute and a horizontal range of 16 kilometers this gun is an ideal weapon against all types of aircraft and armored vehicles, including tanks. Well, a 57 mm projectile will hardly cut through the 1 meter-thick front armor of an Abrams or Leopard tank, but a hail of high-explosive projectiles will surely wipe out optics, aerials, smash caterpillar tracks and jam the turret. In addition to its high rate of fire, the heavy 57 mm gun module which boats an uninhabited turret, active protection and an excellent Russian-designed fire control system, performs easy 180 degree turns while ensuring highly accurate fire. In fact I suspect for a long time ago Russia -as China, North Korea- was developing a new cheap 57 mm air defence with new guidance. Like as we've talked laser, and a new to track enemies aircraft without they are aware, like a kind of IRST. Moreover the secret is in its future ammunitions. The best must be the APHE-T as it could penetrate the armour of the aircraft, and explode its high explosive content, it must be devastating. For that reason, I suspect the effective range is around 5-6.000 meters, other than 1.500 meters as they said in FAS. If the new S-60 contained a new guided ammunition it will deter any bombardment below 8.000 meters. The He-T ammunition in Vietnam hampered US air campaign, as in order to flee, or to avoid the huge losses US were obliged to fly above 6.000 meters and to bomb, but in this altitude, the effectiveness was aleatory. If Russia developed a new revolutionary S-60, it could be a severe blow to US. If you have more info about the future ammunitions, guidance, the altitude range please let us know. This gun, the M1950, was introduced in the late 50s and is basically referred to as S-60 anti aircraft gun. It is a medium range recoil operated cannon and replaced the earlier 37mm AA weapons almoust throughout the Warsaw Pact. Considering the design of the gun, Soviet engineers must have studied the wartime German "5,5cm Geraet 58" AAA. The weight of the S-60 was 4,6 tons and it had a 4160mm long barrel with destinctive muzzle break and downfoldable shield. The S-60 gun is fixed to a four wheel carriage and it was also used against light armored ground vehicles in the ground support role. A S-60 battery generally consists of six guns, a fire-control radar, and a fire-control director. The earliest versions had a PUAZO-5 fire-control director and a SON-4 radar, however, improved director/radar combinations were used in subsequent years. The ammunition is fed in 4-round clips into the gun, the rate of fire was 105 to 120rpm, range was 6000m with radar guidance, 4000m with optical sights. China also built its version of the S-60 and called it Type 59 anti aircraft gun. A self propelled version of the Russian gun, the ZSU-57-2 had a double barrel cannon designated S-68 mounted on a modified T-54 fuselage. It was introduced in 1957 and has basically the same characteristics as its single barrel brother, however, the ZSU-57-2 was not radar guided. The self propelled AA gun had 316 rounds of ammunition storage on board and is now considered as obsolete and was replaced by SAM systems arround 1980. China called its self propelled guns Type 80. The AK-725 AA gun was the Naval version of the S-60 gun and was introduced in 1958. It was mounted in single, double and quadruple mounts designated ZIF-31on many early destroyers. Elevation was 0/+90°, the mount could be turnt 360° around. The ZIF-72 Naval AA gun was enclosed in a metal housing and fully automatic. It was a double barrel mount with water cooled barrels, it was also exported to India. The ZIF-72 was introduced in mid 1970 and was also a recoil operated weapon but ammunition was fed in belts, its overall weigth is 25 tons. Elevation was -10/+90°, the mount could be turnt 360° around. The S-60 type of guns were widely used in all RFAS states, it also was the main small AA gun of the North Vietnamese army. They may still be in use in the former Yugoslavia and the Middle East. The HE-T shells have a blunt ogive shape and a long burning (about 12 sec.) No. 8 tracer element. A single large gilding metal driving band is fitted that has pronounced grooves. Cartridge cases are brass, silicon-brass or steel, those made of silicon-brass have the letter "K" imprinted in the headstamp. A-IX-2 high explosive and has a MD-10 delay base fuze with tracer No. 2 fitted. It is lacquered dark gray and has black lettering. The AP shells may not be used against airborne targets, only on light and medium armored tanks and are effective only up to 1500m. Rounds UOR-281 and UBR-281 (without letter U) have the same shell, but have a thinner case mouth and shallower swage grooves. The UBR-281 shell may also only have one swage groove and the UOR-281 shell may only be swaged with the above swage groove to the cartridge case. The UOR-281U-IN is basically the same as the UOR-281U but filled inert and with a dummy fuze. This practice shell is painted black above the bourrelet and gray below and has white lettering and the word "INERT" painted on in Russian. The UBR-281U-IN is basically the same as the UBR-281U but filled inert and with a dummy fuze. This practice shell is painted black above the bourrelet and gray below and has white lettering and the word "INERT" painted on in Russian. All cartridges above have a propellant charge of 1180g of 11/7 smokeless powder and a KV-5 or KV-5-U percussion primer screw, maximum chamber pressure is 3100 kp/cm². If a shell is stuck in the barrel, a shortened cartridge case may be used to shoot the barrel free. The mouth of an empty cartridge case is cut by 30 to 35mm and loaded with 75% of the standard propellant charge which is fixed by a piece of cardboard. The MK-281 blank round has a charge of 560g of 4/1 blank-cartridge-powder. A proove cartridge with water filled substitute projectile is used as well. Inert drill rounds are used as well, the inert shell is fixed with a steel rod to the base of the cartridge case. The round has the same appearance and weight as life rounds but is lettered for identification. 5 rounds are packed in a gray-green lacquered wooden box that measures 650x580x210mm and weights 49kg. Ammunition is/was manufactured by Bulgaria, China, former Czech Republic, Egypt, Yugoslavia, Poland and Russia. Early Russian cases and newer Polish cases can be made of steel as well, cases of Silicon-brass were used as well. A couple of things to keep in mind... first of all the APHE-T round certainly would be totally devastating to almost any target, because an explosive inside a target... especially filled with fuel and soft human bits is very vulnerable to such things... the outer shell of a vehicle normally offers some protection from blast damage even very thin vehicles, but with internal explosions that outer shell contains and concentrates the explosion inside the vehicle making blast damage much much worse. A pile of powder on a table will go fluff if you set fire to it. Put that same pile of powder inside a cartridge case inside a rifle and ignite it by pulling the trigger and pressure builds and while the same power is released it is concentrated and you hear a real bang as the gas escapes the barrel. Second thing however is that the guidance and flight control bits needed for a guided shell means the guided rounds wont carry anywhere near the same HE payload a standard dumb round will, and it also wont be moving as fast when it leaves the barrel. Having said that a high portion of effective range is accuracy, and a guided shell could be lofted ballistically at the target and rely on sheer mass for effect with a HE payload of perhaps 1-2kgs. I remember comments about the naval 57mm gun having an effective range of 12km with HE shells against area targets. This might sound funny but somehow i feel that Iran somehow pioneered comeback of these 57 and 76mm AA guns, now you ask how and laugh, BUT. Couple years ago Iranians presented their "new" AA gun 100mm "Sa'eer". "The Sa'eer or Saeer is an Iranian upgrade of old Russian or Chinese 100 mm air defence gun. Iran has a stock of obsolete Soviet KS-19 100mm anti-aircraft guns, some likely captured from Iraq during the 1980s. The Sa’eer would be based on the Russian made anti-aircraft gun KS-19 or its Chinese equivalent the Type-59, but now equipped with automatic motorized positioning system and firing radar. A crew is still required for reloading. With automated targeting and alignment far greater accuracy should be obtainable, likely increasing effective range and altitude. The system is still unsuited to “CIWS (close-in weapon system)” type employment but a useful stop-gap addition to Iran’s more capable SHORAD (Short Range Air Defense) missile forces like SA 15 Tor deployed at Natanz. The Sa'eer can create a shield against enemy aircraft and missiles at medium and low altitude. The most important feature that it can be control by complete smart system which requires the minimum operating personnel." And then after 2-3 years whoala everyone started roaming though their old high caliber self propelled AA gun projects and started reviving them, most notably Italians with Draco and Russians with their 57mm turrets. I mean it could and probably is a coincidence i just love how it happened . The KS-19 and the KS-21 were always designed as anti aircraft weapons (100mm and 130mm guns) and had radar support. They were made obsolete fairly quickly as missiles became more reliable and came down in cost. 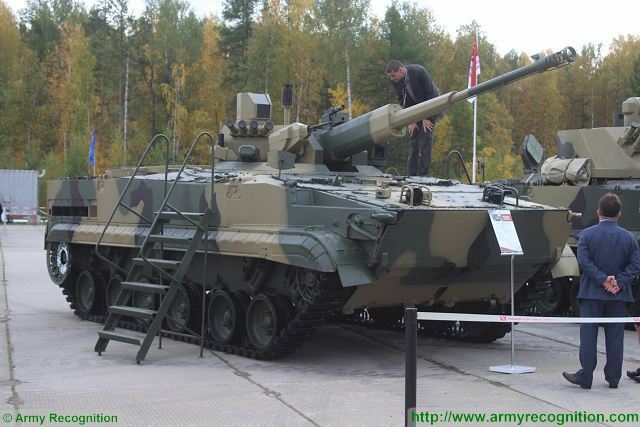 The 57mm gun is being revived in Russia not for anti aircraft purposes, the main reason is because full calibre tank gun missiles are more expensive per round than dumb rounds and 30mm cannons just wont penetrate IFV armour at battlefield ranges any more. The 57mm calibre with APFSDS rounds should be able to penetrate any Bradley or Warrior at 2km fairly easily... its added advantage of having a calibre large enough to allow guided shells for AA use is a bonus. regarding anti aircraft guns of large calibre we can blame the italians for that... with their 76mm gun vehicle in the 1980s. GarryB wrote: The KS-19 and the KS-21 were always designed as anti aircraft weapons (100mm and 130mm guns) and had radar support. They were made obsolete fairly quickly as missiles became more reliable and came down in cost. I am well aware KS19 and KS21 are AA guns however they were removed from the service almost everywhere in the world and suddenly they got pulled back into service in Iran with automated loading system, new radars and optical tracking devices etc. Atm i belive only two countries to operate high caliber self propelled guns (not counting NK and fact they still use KS19 in original state and ZSU57-2 which) are Iran and Sweden with their LvKv 90. 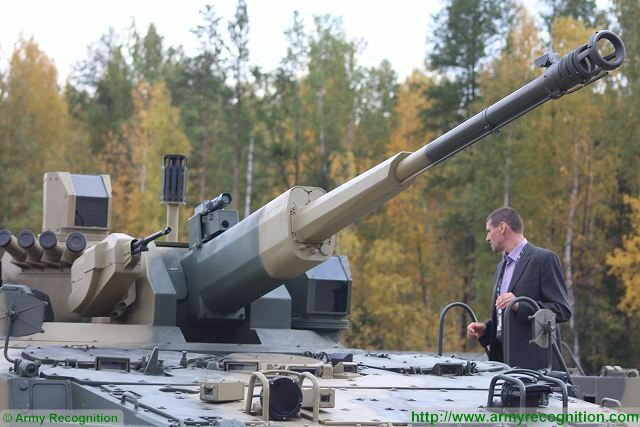 From what i am seeing Russians are also trying to build AA platform with 57mm gun too beside original role for AU220M turret to be used on IFVs. Yes Otomatic was somewhat of a pioneer but it was forgotten very fast. As you likely already know fully well large calibre AAGs are made obsolete by modern missile technology. These large calibre guns... even with radar guidance and auto loading would have to fire thousands of rounds and even then may not hit anything. In comparison a medium range missile might get a kill every 10-15 launches for older missiles and much better performance with newer systems. The Osa replaced the 57mm guns because anti aircraft performance of the 57mm guns required very skilled operators and large numbers of guns and lots of ammo to be effective. The main reason the 57mm gun is being looked at is because guided shells make it more effective. The 37mm guns of WWII were replaced by more powerful 57mm guns in the hope that they would be effective over greater ranges. It was found the low rate of fire reduced hit probability, so it was replaced by 23mm cannon and even 14.5mm HMG which had much shorter range but higher hit probability. As we know these systems were powerful and effective but with helicopters being introduced with standoff ATGMs the 30mm cannon was introduced along with missiles to compliment them... high rate of fire but heavier shell with better range. The 57mm round was being revisited as a replacement for the main gun in the PT-76 and guided shells were looked at. Guided shells made their use against point targets at extended range possible and the larger calibre allowed for better armour penetration for enemy light vehicles. There was already a programme to develop a replacement for the 30mm cannon shell used in all Russian armed forces branches (Air Force, Army, Navy) and it was either a 45mm or a 57mm calibre weapon... This was revealed in the early 1990s when the Il-102 alternative to the Su-25 was revealed and it was mentioned it would have had a 45mm or 57mm belly mounted anti armour gun. GarryB wrote: As you likely already know fully well large calibre AAGs are made obsolete by modern missile technology. I agree on part where you say that guns during 60s and 70s were greatly outperformed by missiles, however i do not agree on your statement that they need to spend thousands of shells to destroy something today, actually Italian Draco apparead to have exeptional target destruction rate with just couple of shells on up to 12km ranges. Effectiveness of SPAAGs greatly improved over guns that were connected to "direction pointers" and not radars and lacked any kind of optical channel etc, so yeah they did perform quite poorly compared to missiles. So if you mix in one unit some short range SAMs and high calibre SPAAGs you get full spectrum of engagement, you engage slower and less dangerous targets with Draco, and you engage further and higher speed targets with missiles, i hope you follow what i am trying to say. One proximity fuse 76mm shell for for Draco probably does not cost more than 100USD probably, meanwhile one missile for Tor or Pantsir has quite a significant price, and they both will generally speaking engage same spectrum of targets, Serbians in 1999. were managing to shoot down cruise missiles, even gliding bombs with 20mm guns, if they had modern SPAAGs of 57 or 76mm target envelope would be alot higher coz 20mm guns have very limited target engage altitude. So i cannot really agree on that, i dont belive high caliber AA guns are to be part of the past. Yeah i am aware of 57mm gun plans to be used on corvetes and that is capable enough weapon for them, however what i would like to see is Russian aircraft based gunship with such gun, that would be very interesting something based on IL112 for an example. MOSCOW, December 24. /TASS/. Russia is developing a new antiaircraft artillery system with a 57 mm gun, Air Defense Troop Commander, Lieutenant-General Alexander Leonov said on Thursday. "A promising antiaircraft artillery system with a 57 mm gun is under development to replace our Tunguska and Shilka complexes," Leonov said in a live broadcast of Rossiya-24 TV Channel. The Shilka is a Soviet-made self-propelled antiaircraft system armed with a quadruple 23 mm gun designed to provide cover for ground forces, destroy air targets at ranges of up to 2,500 meters and altitudes of up to 1,500 meters flying at a speed of 450 meters per second. The Tunguska missile and gun system is designed to detect, identify, track and destroy various types of air targets (helicopters, tactical aviation planes, cruise missiles and drones) and also to destroy surface and ground targets. The largely expanded engagement footprint ,over 12 km against similar "soft" air targets, will moreover not only allow to destroy similar menaces largely before them get a chance to accomplish theirs tactical task (for surveillance UAVs collect and disseminate positional data and for PGM reach theirs defeating area , included submunition delivery) but also allow the reengagement of objects surviving the first volley. Unification with standard ground forces IFVs and BMPTs types will also allow to establish an integrated battle management system capable to maximize the harmonization of area of coverage between EW support vehicles, anti-air specific complement and those ground forces vehicles with secondary area denial capabilities thanks just to the 57 mm guns increasing the resilience of mechanized and armoured divisions to today and perspective PGM attack on a completely new level. Ha i told you they will do this You didnt belive me back in time. Commander of the Russian Land Force’s air defense stated that Russia is developing a new 57 caliber anti-aircraft weapon system to replace two existing systems. Russia is developing a new 57 caliber anti-aircraft weapon system to replace two existing systems, the commander of the Russian Land Force’s air defense said. "A promising new anti-aircraft artillery system with a caliber of 57 mm is being developed to replace ‘Tunguska’ and ‘Shilka’ systems," Lt. Gen. Alexander Leonov told reporters late Thursday. The ZSU-23-4 "Shilka" is an all-weather lightly armored self-propelled and radar guided anti-aircraft weapon system that has been in service since 1962 The tracked 2K22 "Tunguska" self-propelled anti-aircraft weapon armed with a surface-to-air gun and missile system began serial production in 1964 and entered into service in 1982.Russia is undergoing a $325-billion rearmament program to modernize 70 percent of its equipment by 2020. Maybe like former ZU-57, but with radar, optical and infrared devices and modern full automatic guns? Ofc i welcome return of high calibre AA guns, they are extremly cost effective compared to missiles even compared to cheapest ones like Verba/Igla/Mistral/Stinger and their accuracy with modern FCS and dedicated ammunition is excellent. But i dont really think direct fire from 122mm howtizers is needed today, you have fire support vehicles with 105/120/125mm guns for that role, tanks, IFVs with high caliber high velocity guns etc. I dont find it crucial, actually during Yugoslav wars i barely ever heard of direct fire by 122mm D30s, thats what i base my conclusion on. Direct fire rounds for 122mm guns are for self defence only.. but they make any platform with a 122mm gun more flexible as it can defend itself and destroy a wider range of targets on the battlefield. Direct fire is always much more accurate than unguided indirect fire. New IFVs will need larger calibre high velocity weapons to be effective... and IFV needs the capability to engage equivalent vehicles at 2km range or more so 57mm high velocity would be rather useful in the ground to ground as well as ground to air roles. Bog standard unguided rounds will be fine against most point or area targets on the ground but it would be much more efficient to use guided shells for airborne targets. Even with good FCS a manouvering target would require thousands of rounds to be fired at it to get a good kill probability but with guided shells one or two could do the job... greatly increasing the number of targets to be engaged on a full load of ammo. i dont think 122mm MLRS should go anywhere, however i just dont direct fire capability to be a must on light artillery. Back in time it was your only defence aganist tanks and armored vehicles, today as i already said you have plentiful and very widespread use of ATGMs and disposable AT weapons even in smallest infantry units. That might be your experience but clearly the Soviets and Russians think direct fire heavy HE rounds are a must... the BMP-1 remained in service with the BMP-2 because its HE capacity was much greater than any light auto cannon and BMP-3s 100mm gun proves the concept was clearly found to be useful of having a light auto canon and a heavier gun. With the need for larger calibre guns (57mm) means a larger HE payload can be carried by one gun... very similar to the transition in WWII when tanks had machine guns or short barrel 76.2mm guns firing low velocity HE shells for use against enemy troops, while their anti tank vehicles had high velocity 37mm and 45mm and 50mm guns and machine guns. The breakthrough tank was the T-34 with a medium velocity 76.2mm gun intended to do both jobs... ie significant HE fire power and armour penetration performance too. Contrary to popular belief the Soviet 45mm anti tank gun did have a HE round which meant it could serve out the war as an infantry support weapon against light vehicles and bunkers and light buildings. More likely a single 57mm gun as high rate of fire is not so important when you have guided shells. Likely it will also have missiles in the form of SOSNA perhaps? Is 57mm gun overkill for AA role ? higurashihougi wrote: Is 57mm gun overkill for AA role ? Naa, not really. Actually it might be perfect AA caliber with good FCS coz sizeable 57mm shell as it is can allow intergration of some very interesting types of fuses with sensors etc. Also it offers far greater reach than common 20, 25, 30, 35 and 40mm AA gun calibers, plus their potential on target in terms of mass would be far greater. It is not excessive it is actually now quite necessary. Anti aircraft guns are a compromise between hit probability and hitting power and range. You could make an anti aircraft gatling gun in 9x18mm... the light small cartridge means you could have an enormous rate of fire with hundreds of thousands of ready to fire ammo making hit probability very very high because the number of rounds you put in the air. the problem is low energy means totally weak hitting power and very poor range. At the other end of the spectrum you have a 152mm artillery system... range could be enormous and hitting power could destroy any aircraft with even a near miss, but extremely low rate of fire means hit probability is very low. After WWII the Soviets had a 37mm AA gun that combined good hitting power and range and with auto fire average hit probability. the replacement was the 57mm gun (S-60) with more power, more range and improved hitting power... the problem is that targets were getting faster. The solution was not just higher rate of fire because the 57mm rounds were huge and were never going to be fired in high rate of fire bursts. A fast moving target is predictable as long as it does not manover or slow down or speed up. Even a rather fast target can be hit reliably with one shot. the problem is that if it is manouvering then the interception point becomes an interception box and to assure a kill you have to fill that interception box with exploding shells... lots of them. The solution for the Soviets was the 23mm cannon in a cluster of four barrels that would send a shower of cannon shells... the result on target is like a cluster of shells like a shot gun blast arriving nearly at once all around the airspace the target will occupy. Over time targets got better armoured and better armoured so more range with a heavier shell was needed so 30mm weapons were adopted as the rate of fire was still very high and shell weight increased and effective range increased. the problem now is that a UAV or UCAV is tiny so even a very dense shower of projectiles might not guarantee a hit so multiple bursts would be needed in 30mm or lighter calibre. The solution of a heavier calibre would normally make things worse because fewer shells per minute means more gaps for the targets to fly through... but heavier shells means better effective range, more effect on target with a hit and the most critical... the ability to use guided shells to assure hits with one or two shots. Guns are multipurpose so a 57mm gun battery might 2/3rds of the rounds they carry as guided anti aircraft shells, but a few anti armour and simple HE shells for closer range or area targets... they can also do things most missiles can't like a delayed fuse time so you can aim at a tree and have the shell pass right through and explode on the other side to kill a helicopter hovering behind for instance. It is a good idea. Surely very useful. And the selection of the 57mm caliber seems very logical. Maybe Russia keeps still some 57mm ammunition for the ZSU-57-2 in storage. Also some countries still use them. These countries surely will welcome more modern 57mm ammunition to give longer life to their ZSU-57-2. Link to wrongly moved posts from this topic to the topic of the S-60 and the ZSU-23-4. Between the pages 3 and 6 of this other topic there are comments about potential configurations of the new weapons of 57 mm talking about multiple barrel configurations like the case that we can see later in this topic. sorry if already posted, Some pics of BMP-3 with 57mm gun with sources provided, theirs also a video clip on one of the sources showing it entering water. If this new gun could reach more than 12.000 meters in vertical, it would be a huge game changer. I suspect many works in research and development in this area. The range could be overpass 12 km, if so, it could be an important breakthrough in air defense. Moreover the RPM would be more than 120 per minute, if you add an improvement in the velocity of amnunitions more than 1.800 m/s, it will deter every bombardments. The guidance is by laser. The F-22 could bomb in theory at 15.000 meters, but in practice, it is obliged to bomb around 5.000 to 6.000 meters to hope any effectivemeness, with JDAM, or other GPS guided bombs. It will be useless. Really it is a very important development, and Iam clearly happy. The first prototype of a self-propelled anti-aircraft artillery complex "Derivation-defense" will create in 2017, RIA Novosti reported with reference to the general director of the Central Scientific Research Institute "Petrel" George Zakamenny. According Zakamenny, currently carried out development work on the creation of the complex of caliber 57 mm for the air defense forces, and next year it is planned to build the first prototype. "Derivation-defense" - promising rapid-propelled anti-aircraft artillery system being developed based on the experience in the field of guided artillery shells, tank shoots from a barrel, and anti-aircraft missiles of short-range. The complex will be equipped with special anti-aircraft missile, which is being built under the scheme guided artillery projectile launched from a rifled barrel gun and is induced by a laser beam. Range - from 200 meters up to six to eight kilometers. Kadex 2016 the exhibition of the new AU-220M 57 mm. In fact this new IFV, aimed for Air defense is really a game changer. 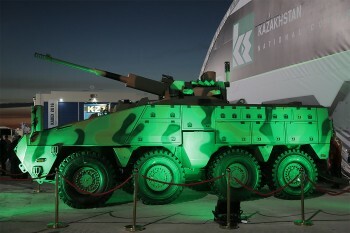 Last night, in a festive atmosphere with the participation of President of Kazakhstan Nursultan Nazarbayev was presented the product of teamwork Corporation "Uralvagonzavod" and the company "Kazakhstan Engineering Paramount": an armored personnel carrier "Barys" (8x8) integrated into it a 57-mm automatic gun mount au- 220M from Uralvagonzavod. Range 12 km, the rate - 120 rounds per minute. However, it can rotate 360 ​​degrees in azimuth and from -5 to 75 degrees vertically. Today in the world there is no APCs and IFVs can withstand AU-220M shot. Yesterday saw the car President and VIP guests, and today it will see everything. It has become the central and most important exhibit of the show! Army Leaders of Kazakhstan has already announced that the car will go into service before the end of 2016! 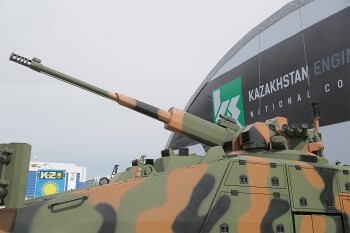 The main event KADEX-2016 was the premiere presentation of the joint project of "Research and Production Corporation" Uralvagonzavod "and LLP" Kazakhstan Paramount Engineering "- APC« Barys ». The Director-General Oleg Siyenko Corporation took part in the solemn presentation of the machine to the President of the Republic of Kazakhstan Nursultan Nazarbayev. 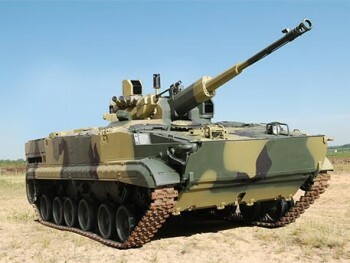 He told the head of the republic of a unique 57-mm AU-220M automatic artillery installation of production of JSC "Central Research Institute" Petrel "(part of the corporation" Uralvagonzavod "), which is integrated in the Kazakh chassis with the wheel formula 8x8. Desert combat module is designed as a remote-controlled combat system of circular rotation. It is designed for advanced weaponry and upgraded armored vehicles to increase the firepower of infantry and mechanized infantry units. The power of 57-mm ammunition guns allows to hit the battlefield most of the existing armored targets. Today in the world there is no APCs and infantry fighting vehicles, capable of withstanding AU-220M shot. Basic installation characteristics: range up to 12 km, the rate of fire - 120 rounds per minute. However, it can rotate 360 ​​degrees in azimuth and from -5 to 75 degrees vertically. 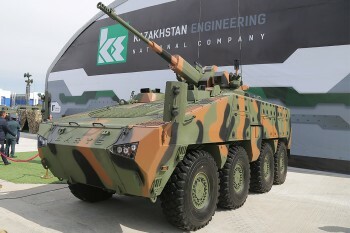 According to the Deputy Minister of Defense of the Republic of Kazakhstan Okas Saparova, already in 2016 the first batch developed in conjunction with the corporation Uralvagonzavod APCs "Barys" will be sent to the armed forces of the Republic of Kazakhstan. 57 mm anti-aircraft gun would be very effective because projectiles and guns, different from missiles, can not be jammed. 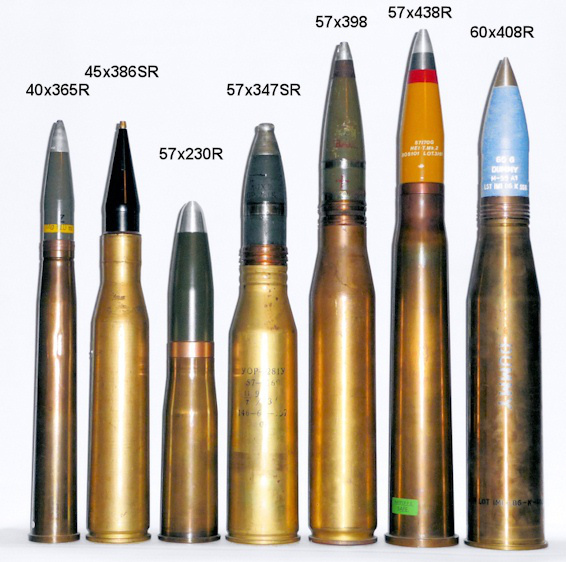 Basically only one round of 57 mm shell would shoot down an aircraft.